The U.S. Housing Tides Index™ was little changed in February, increasing to 71.3 from 71.0 in January. This marks the sixth straight month of year-over-year declines in the Housing Tides Index, with the Index down from 72.8 in February 2017. However, local scores were mixed, with 22 of the 41 MSAs tracked by Housing Tides indicating improved conditions from last February. 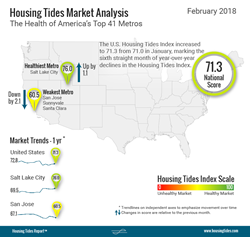 This week marks the release of the February 2018 Housing Tides Report™, featuring an update to the Housing Tides Index™, an objective and sophisticated approach to quantifying and comparing the health of U.S. housing markets. Despite ranking 37th of 41 metro areas, the New York-Newark-Jersey City, NY-NJ-PA Metropolitan Statistical Area (MSA) showed the most improvement in the last year, with the area’s Housing Tides Index increasing by 7.8 points. Driving the increase were job gains that accelerated as nearly 92k jobs were added in the MSA for the year ending November 2017 and an improvement in rental affordability as new units continue to be delivered to market. Please reference the attached graph to view the Ten Healthiest U.S. Housing Markets - February, 2017.